Whether one is renovating a commercial gym or setting up a home gym from scratch, it is a long and complicated process that goes far beyond ordering exercise machines online. Furnishing a commercial gym begins with deciding upon quality gym flooring material that can withstand heavy foot traffic on a daily basis. Similarly, the impact of the type of gym flooring has on the home gym owner’s exercise routine and health is immense. For example, rubber flooring prevents injury during a workout due to its superior shock absorption qualities. There are companies that offer professional services to design and furnish gyms by the square footage. The advantage of a gym owner conducting some preliminary research themselves is the satisfaction of getting the right flooring option at the best possible rate. If the commercial gym or home gym space you are working with already has wooden floors, all you will need to do is decide upon adequate covering material. Traditional wooden gym flooring is extremely versatile and well-suited to be used by athletes wearing padded trainers. However, when wooden gym flooring comes in contact with pointy-heeled shoes or weightlifting equipment gets dragged off mats, that is when irreparable damage takes place. Invest in affordable yet durable gym flooring materials to protect your gym’s original wooden floors from excessive wear-and-tear. Rubber Flooring: Perhaps the easiest flooring for home owners or private gym owners to install themselves is rubber flooring. It requires zero prior installation experience and is one of the most durable shock absorption gym flooring options around. Recycled rubber flooring can cost as little as $0.99 while the more designer virgin rubber flooring series can run over $4.00 per square foot.Once installed, rubber flooring provides an average of ten years of replacement-free utility. Due to their extreme resilience, rubber gym flooring rolls are often installed where heavy-duty weight lifting or cardio routines take place. Specially-designed rubber mats with traction treads are sold exclusively to be used under weightlifting equipment. Compared to carpet tiles, rubber flooring is easier to clean and just requires a quick vacuum or mop to as good as new. Rubber flooring does not absorb water and is unable to host unhealthy fungi, mildew and mold growth. Thick, soundproof rubber floor doubles as insulation and restricts noise to the confines of the home or commercial gym. Carpet Tiles: Gym flooring tiles made from carpet are a favorite for homeowners as they are easy to take care of and soft enough for young children to roll about on while their parents work out. The interlocking tile design does not require a professional for carpet tiles to be locked into place. Even if you end up installing carpet tiles for your gym yourself, you will need to call in a professional carpet installer to re-stretch and clean out the tiles every few years. Carpet tiles stretch under heavy use and also have a tendency of holding on to moisture. There is a great number of colorful designs and patterns to choose from in the carpet stores. One possible downside to utilizing carpet tiles in the home gym is the possibility of flooding. Home gyms in the basement with carpet tile flooring can not survive damage from flooding or other extreme weather conditions. Vinyl Tiles: Though originally produced to serve as flooring material for the garage, vinyl tiles have quickly become a staple flooring option for all parts of the home. Seeing how vinyl tiles are extremely flexible and durable, they mimic the qualities of rubber flooring while also being available in brighter colors in the marketplace. Much like the carpet tiles, vinyl tiles also feature the ‘snap-n-lock’ grid option that makes for stress-free and affordable gym floor installation. Vinyl tiles contribute to a healthy, hygienic gym environment as its naturally composed to resist all types of mildew and mold growth on its surface. This type of flooring is extremely convenient to maintain; all one needs to do is run a vacuum cleaner or mop lightly.One of the disadvantages of working out on a vinyl tile gym floor is that it does not possess the shock absorbency of foam or rubber gym flooring. Foam Flooring: Unlike the other gym flooring options, foam flooring is considered a soft flooring material that is best suited for floorwork. Aside from fitness buffs and dancers who focus on stretches and other mat work, foam flooring is plush and comfortable enough to be used as a flooring for children in a play area at a preschool or at home in the spare bedroom. Foam flooring offers premium shock absorption as well as an amazing variety of colorful patterns and designs to customize your home or commercial gym with. Foam flooring can offer excellent support for fitness club members working on their barre or Pilates positions. In addition to permanently installing foam flooring, gym owners can also piece together a custom-sized mat of interlocking pieces for insta-workout spot just about anywhere! A foam flooring piece works best for those who practice yoga, aerobics or other such indoor workout routines. The best time of the year to shop for bargains is during the month of November. Most rubber flooring contractors will be offering competitive discounts to new customers to gain business during their down season. Not all businesses will quote similar prices for gym flooring and there is a reason for that. The end price quoted to customers for rubber flooring includes each company’s varying overhead costs and operational expenses. A good rule of thumb when on the hunt for a rubber flooring contractor is to communicate and get at least 3 different estimates before placing the order. In most cases the companies provide quotes free-of-charge. 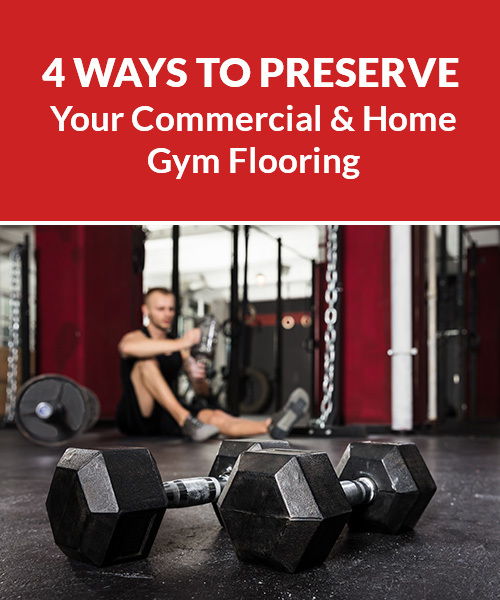 In addition to the gym flooring options discussed above, commercial gym and home gym owners are installing light-duty carpet covers over their original wooden floors. These carpet covers cost less than authentic carpeting but more than vinyl flooring and comes in rolls like vinyl covering. The decision to invest in a particular type of gym flooring becomes a cinch once the quotes and facts are apparent. Contact the flooring experts at A.E.S. Fitness to get a free estimate for your home or commercial gym flooring today.